Climate change is real and it’s happening at a much faster pass. Leonardo DiCaprio made this film to make people aware and educate them about climate change. DiCaprio is the U.N. Messenger of Peace on Climate Change. He goes around the world to show how climate change is affecting different people and places. He goes to Baffin in Canada where ice is melting. They tell him there that by 2040 there will be no ice left on the North Pole. He goes to India where they saw half the years rainfall in 5 hours. He talks about fossil fuel at great length, as being one of the leading causes of climate change. There is no clean way of getting fossil fuel. In China they are trying to get more of their energy from solar power. Why is the US not trying to do this? People can make changes. DiCaprio admits that his footprint is bigger than most peoples and he seems to question it. I was very glad that Before the Flood mentioned meat consumption (many environmental films have failed to mention it) People can lessen their meat consumption. 70% of land is cleared for feed for cows. Cows produce Methane. They burp and methane goes into the atmosphere. Methane is more toxic than CO2. Too much methane and the surface of the planet becomes too hot. I was also very glad that this documentary talked about palm oil, which many people are unfamiliar with. I recently went to Indonesia to volunteer at an orangutan sanctuary. Orangutans are now critically endangered. Leonardo went to Indonesia and visited the Leuser Ecosystem. The Leuser Ecosystem is the last place on earth that still has elephants, rhinos, orangutans and tigers living together. Palm oil has destroyed 80% of the forest in Indonesia. They set fires intentionally to grow palm oil, which is a cheap oil, that companies profit a lot from, but at what expense? I loved the films soundtrack, which was done by Trent Reznor and Atticus Ross. This is a must see for everyone. I hope this film will make people more aware of what’s going on with our planet and what steps people can take to help. Leo himself is not too optimistic, but we can all at least try. I do wish the film offered more advice on what the general public can do to help. 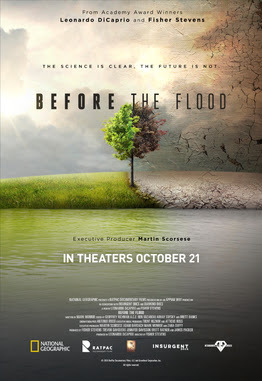 Before the Flood is currently being offered FREE to stream until November 6th on various platforms.